We pride ourselves on our software expertise and focus primarily on embedded software that interacts directly with the hardware of the device it resides on. All software listed here has been developed by Element ID. 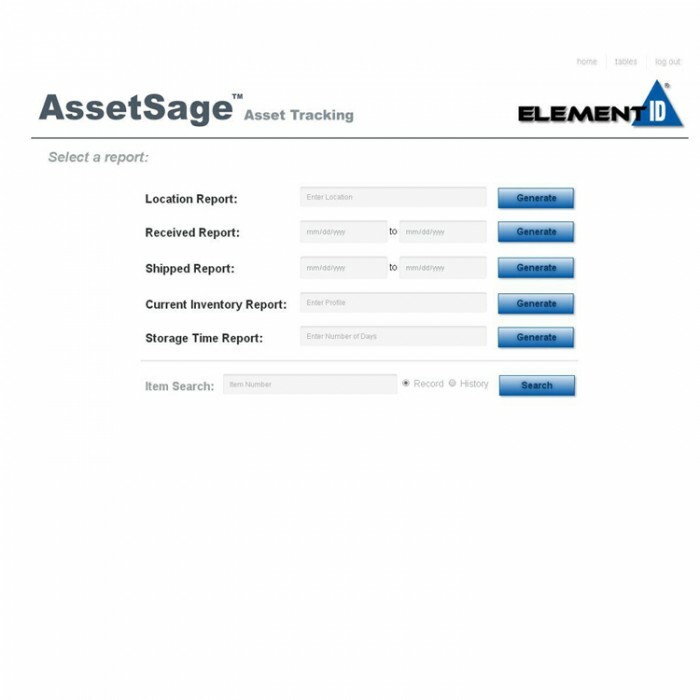 This is a remotely hosted, entry level asset tracking package sold on a monthly subscription basis. The product was designed with cost in mind and has no bells and whistles. Basically, this is a customizable database with a clean, simple to use, user interface and a few basic reporting functions. The product can be customized to your specific needs. It can be run as a standalone system or integrated into your ERP system. The cloud hosting makes it ideal for enterprises with multiple locations. Data is available with valid credentials from any Internet connected device, anywhere, anytime. We found that although we had a lot of customers with a need to track raw materials/finished goods, projects just weren’t getting done because the software implementation was either too expensive or was going to take to long to get through IT. We created an entry level package with the idea that customers would use it as an interim solution. However, we have customers that have never switch away and we have others that never intend to buy anything else! This product offers significant return on investment and the low capital outlay to get started may make it ideal to get your auto ID project moving! This product combines HyperSage Mobile with an on-board database targeted toward small business and departments within larger companies. All the software, functions, and data tracking reside on the handheld scanner they are installed on. No need for external PC, server or even a data connection. Data files can be imported and exported. Compatible with Excel. Reports can be generated and then transferred through the docking station or over WiFi for permanent storage or printing. Download the AssetSage™ Mobile Datasheet. Middleware for WinCE, WinMob, and Win Embedded handhelds. Works with barcode, RFID, or both. This product allows for control of the hardware, provides modes of data association, data filtering, and host message formatting. No ongoing license fees. No additional middleware to buy from us or anyone else – connect your hardware directly to the software you already own. Download the HyperSage™ Mobile Datasheet. This product provides the core capabilities of Hypersage Mobile with additional function screens to capture the data you need to connect directly with your ERP or WMS system. The simple, clean interface greatly reduces operator error and frustration vs the typical terminal interface to ERP systems. This is currently available only for our DataGun-I, but we expect to expand available handheld hardware soon. We have completed integrations with Sage X3 and Microsoft Dynamics. Our RFID middleware product that allows for control of the reader hardware, provides configurable modes of operation, data filtering, host message formatting, and direct interface to host servers. This product is included at no additional charge with every fixed RFID solution we sell. No ongoing license fees. No additional middleware to buy from us or anyone else – connect your hardware directly to the software you already own. Our patented technology that links RFID data with physical items. This allows time and position based tracking of RFID-tagged items on conveyor systems. It also enables additional data sources like scales, dimensioners, printer applicators, and PLCs to be linked with the RFID data. A Windows-PC hosted setup utility. Set output bits and function, host message format, reader power, RFID read trigger and duration and many other parameters in minutes using check boxes, drop down menus, and fill in blocks. Set it and forget it – no code to write and no complicated interface standards like LLRP to learn.